Since Sarah and I moved to Chennai, India, in July, 2017, we have both fallen in love with the beautiful, open, welcoming smiles of so many whose city and country we have come to call our home. My walkabouts, in our Besant Nagar neighborhood, through the fishing villages by Elliot's Beach, among the colorful vendors at the streetside markets, and into the temples grand and tiny throughout Tamil Nadu, Rajasthan, Thailand and Sri Lanka, have allowed me to connect and share my photos with those who live and work and pray there every day. Mikka nandri to all our new connections. 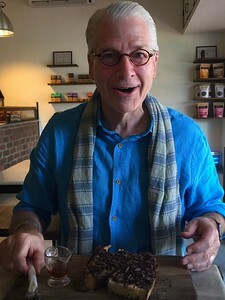 David M. Hassler, MFA, was fortunate enough to have become a relatively rare male Trailing Spouse when his talented wife Sarah accepted a job teaching music in the elementary division of the American International School in Chennai, India. His role allows him time for exploring, discovering, and photographing new faces, new places, and new tastes around Chennai, throughout south India, and beyond. David M. Hassler, MFA has served as a long-time member of the Indiana Writers Center Faculty and holds an MFA from Spalding University. His work has been published in Maize and The Santa Fe Writers' Project. He served as a Student Editor for The Louisville Review and as Technical Editor for Writing Fiction for Dummies. He is currently Managing and Fiction Editor for Flying Island, an online literary journal. He is co-author of Muse: An Ekphrastic Trio, and Warp, A Speculative Trio. He is a founding partner in Boulevard Press. You can follow his and Sarah's Asian adventure at his Fetching a Toothpicker blog.